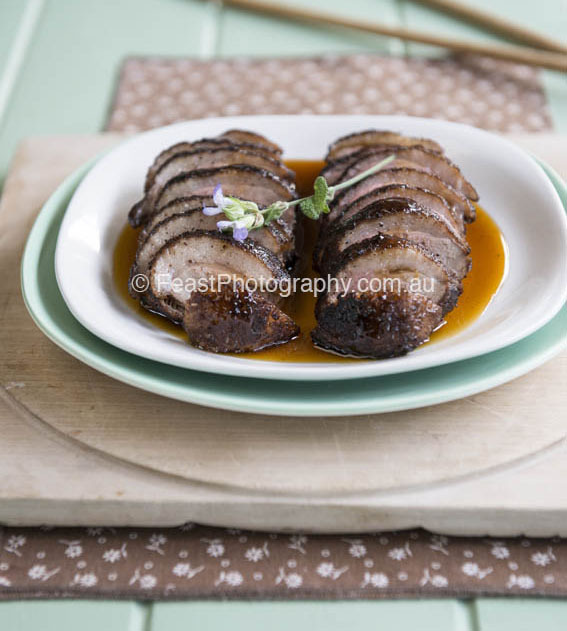 This has become one of my favourite ways of cooking duck breasts. They are tender, succulent and absolutely delicious and the sauce is wonderful too. This recipe also works well with duck legs (thighs and drumsticks). Bring a wok or large saucepan of water to the boil. Rub the five-spice powder over the duck pieces. Put some baking paper in the bottom of a large bamboo steamer. Prick holes in the paper with a fork or a skewer and arrange the duck on top. Cover with the lid and steam over the boiling water for 15 – 20 minutes. Remove the duck from the steamer, put on a plate and refrigerate, uncovered, for 3 hours or until completely cooled, or preferably overnight. Strain the juice from the oranges and reserve two thick strips of peel. Combine the sugar with 185ml water in a large saucepan and bring the mixture to the boil for 5 minutes to reduce, stirring to dissolve the sugar. Add the orange juice, star anise the cinnamon stick and reserved strips of peel and allow to cook so that the sauce reduces. Remove from the heat and stir in the soy sauce and vinegar. Heat the oil in a wok over high heat. When the surface of the oil is shimmering, lower the duck into the oil, skin side down. Cook for 2 minutes, then turn the duck and cook for a further 2 minutes. Repeat this, cooking for a further 2 minutes on either side. Put the duck onto a plate, cover, and rest for 5 minutes. Cut the breasts into thick slices and arrange on the serving plates. Spoon over the orange sauce and the star anise. Serve with wilted Asian greens.